Before we went to Switzerland we had a Swiss dinner to prepare for our trip. In Switzerland we consumed as many classic Swiss foods as we could. This meant eating a large number of veal sausages on a daily basis. However, we didn't get a chance to have everything we had planned on. I planned on remedying this when we returned to the States by making a Swiss dinner as a sort of recap to our travels. Mostly the German part. 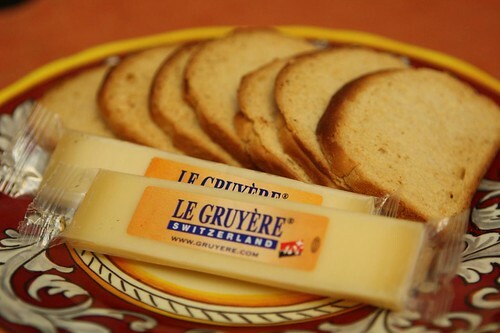 For an appetizer I put out these crackers which had been given to us by Gregg and Ross in Switzerland. I paired them with some Gruyere we'd stolen from the plane and some wine we'd also stolen from the plane. I think the cheese and the wine did not benefit from the sweltering trip in our backpacks from the plane but the crackers aged remarkably well. Those little toasts are fantastic! 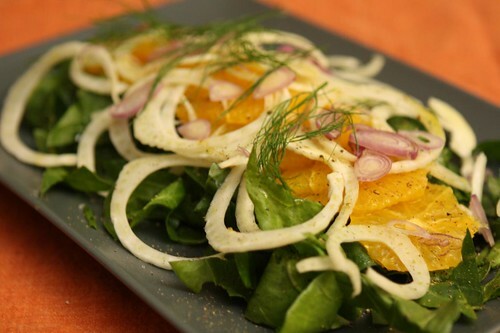 For tonight's dinner I started off by making this light salad with some of the spinach, slices of orange, and thinly sliced fennel with a light drizzle of cider vinegar, olive oil, red onion, salt, and pepper. 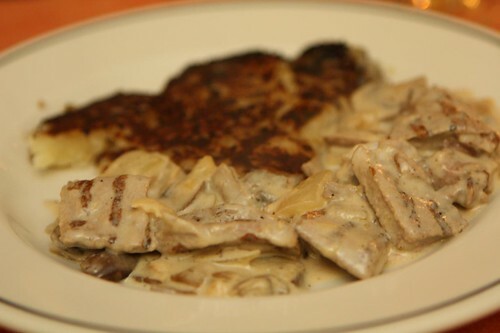 The main course was probably the most traditional of Swiss dishes: rosti potatoes with veal scallopini in a mushroom cream sauce. I tried to recreate our our dinner in Zurich at Terrase by lightly grilling the scallopini first. I made the sauce with some olive oil, butter, onion, crimini mushrooms, white wine, flour, cream, and salt. I haven't really made rosti potatoes since the five minutes my culinary school devoted to our learning the cuisines of Switzerland, Germany, Czechoslovakia, Poland, and The Ukraine. I was also surprised to not really encounter them in Switzerland or on any menu. Therefore it was time to make some! 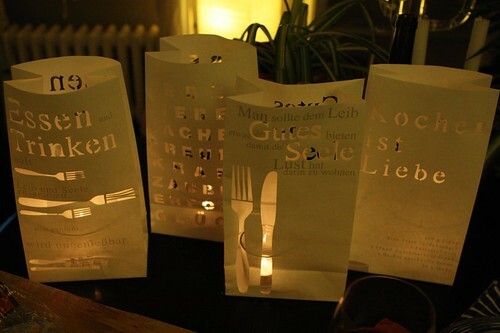 They're extremely easy to make. Just bake some potatoes, peel the skin, grate them into a bowl, add some finely diced onions and salt, then fry them in a pan. And there you have the most typical Swiss dinner as told to me by my culinary instructors during my 45 second training on Swiss cooking. This winter I had the worst beer I've ever had. It was called La Dragonne. It was Swiss and it was awful. While in Switzerland this summer I tried a number of Swiss beers, all lagers, and they ranged from okay to good. I was eager to try all these beers that, to my knowledge, are not available in the U.S. 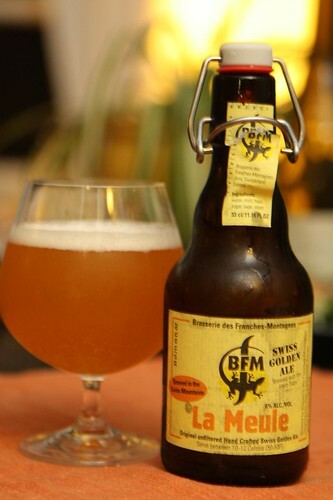 The other day Jen came home from work with a beer called La Meule from Brasserie des Franches-Montagnes. I recognized the lizard on the label and knew this was from the same brewery as La Dragonne. The strange thing is that I was really excited by this. Jen gasped when she found out it was by the same brewery but I was elated. 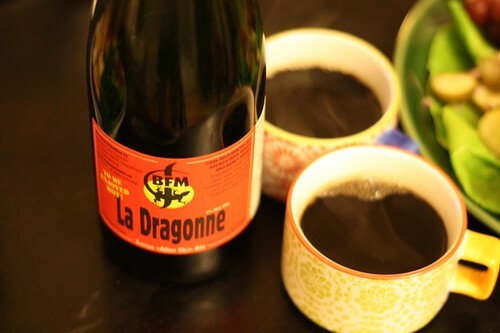 I knew that this beer could be anywhere near as bad as the La Dragonne. In fact, I was certain it would be quite good. And it was! Jen liked it in particular because she said it had a grapefruit taste to it. It did have a slight bitterness to it but, thankfully, not to the extent of La Dragonne. For dessert I made a recipe based off of the Lucerne cookbook's apple pancake recipe. Instead of apples I used the Red Clap pears. The batter consisted of flour, egg, brown sugar, salt, white wine, and grated pears. 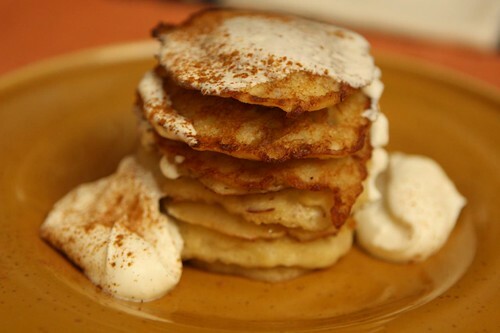 I fried these up in short little stacks and topped them with whipped cream and cinnamon. 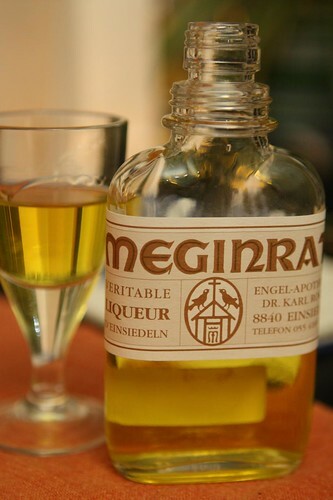 As one last reminder of our trip I poured out a little bit of this Meginrat liqueur I'd purchased on our trip to Einsiedeln. I wasn't sure how to serve it as apparently there is no information at all on the entire internet about the existence of this liqueur. I started by just pouring a small shot of it and drinking it straight. It reminded me a bit of Galliano except in a much, much shorter bottle. I also tried it on the rocks with a little water. I think I like it better straight up but the ice does help to mask the cough syrup like taste to the liqueur. 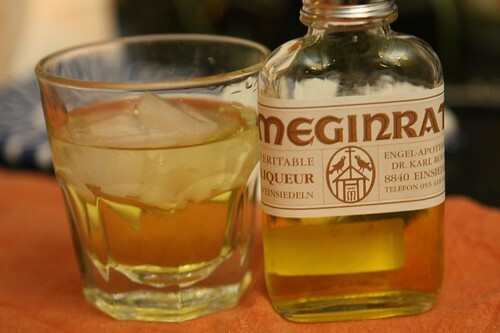 This blog entry has now become the world's greatest archive on the history, preparation, and serving of Meginrat liqueur from Einsiedeln.